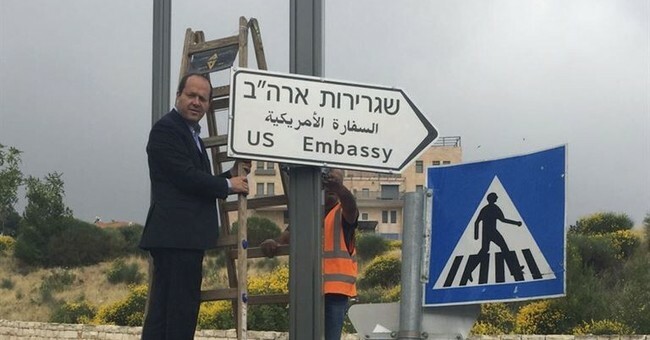 Jerusalem Mayor Nir Barkat visited the location of the new U.S. embassy on Monday to install its sign. The embassy, which President Trump announced would be moved from Tel Aviv back in December, will be the first Israeli embassy of any country to make its home in Jerusalem. “This is not a dream – it’s reality,” Barkat said in a statement after installing the sign. “I thank President Trump for making this historic moment come to fruition. Jerusalem is the eternal capital of the Jewish people – and the world is beginning to recognize this fact." Along with the sign, Barkat also announced that he intended to name the nearby square, located at the junction of David Flusser Street and Kfar Etzion Street, after President Trump. The naming committee in Jerusalem formally green lit a renaming of the square last year. The embassy’s official opening is set for May 14th and many high level diplomats and leaders are expected to be in attendance. However, President Trump will not be in attendance and the U.S. delegation will be led by Deputy Secretary of State John Sullivan, who will be joined by the president’s daughter Ivanka Trump as well as his son-in-law and adviser Jared Kushner. Others set to be a part of the delegation include Trump’s Middle East Envoy, Jason Greenblatt, Treasury Secretary Steve Mnuchin and U.S. Ambassador to Israel David Friedman. While the U.S. now recognizes Jerusalem as Israel's capital, the international community largely recognizes the Israeli capital to be Tel Aviv. The Palestinians also see Jerusalem as the capital of a future Palestinian state and they are expected to protest the embassy’s relocation around the opening ceremony. President Trump’s attendance would likely have amplified those protests.